The content in this knowledge base is based upon the standard FACULTY180 environment. Your institution may have made changes to configure the FACULTY180 environment to meet your institution's needs; therefore, the screens in your FACULTY180 environment may differ slightly from the knowledge base. For more information, please contact your FACULTY180 administrator. 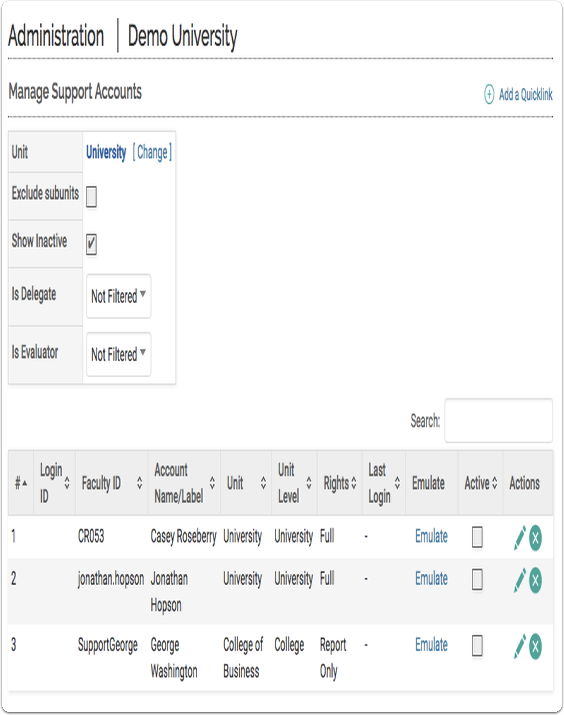 The Search feature allows administrators to search for information in their FACULTY180 database, based on a specific word/phrase. Searches can be filtered based upon a specific unit, date range, and section. This is an effective tool to locate faculty members with activities in an area of interest, and for finding faculty with research interests in a particular area for grant proposals. On the Admin section of the navigation menu, click Administration. In the Tools section, click Search. The Search screen displays. Type the search term in the Search For field. Apply any filters, if you choose. Click Search. The search results display.